What Goes Into Making the Best XLR Cable? An XLR cable provides an electrical path between two pieces of professional audio, video, or stage lighting hardware. They come in various sizes and lengths with a number of different pin arrangements depending on the application. This review will focus solely on the 3-pin XLR3 cable that is the industry standard for professional audio applications. 2019 Update: Colored XLR cables keep things organized! Check out the colored patch cables from GLS Audio further down in our list. After a good amount of research, reviews, and a personal purchase, I recommend the Hosa HMIC REAN XLR cable. 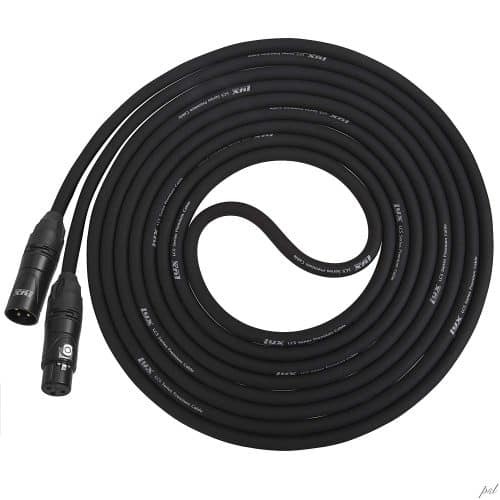 This Hosa HMIC REAN XLR cable is possibly the best value and quality you will find for the money when it comes to XLR cables, and is also my personal pick to connect my mic to my audio interface. 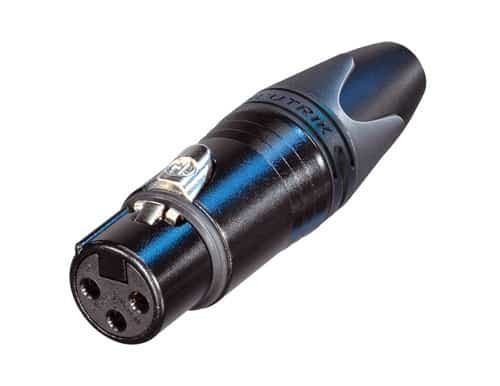 This XLR cable uses REAN connectors, and REAN is a brand of the industry standard connector company, Neutrik. This cable comes in a variety of lengths, and uses 20 AWG oxygen-free copper conductors. Customers in the pro audio field say this cable is on par with high-end XLR cables, and it’s a fraction of the price. The Mogami Gold Studio Microphone XLR cable is a close runner-up in this review of the 10 best XLR cables. If you want the hands-down best for your studio and are willing to pay extra for it, this is your choice. These XLR cables come in a wide variety of lengths, use the Neutrik X connectors, and have four balanced conductors instead of two to eliminate 99% of all RF interference for the cleanest signal. These cables also come with a lifetime warranty from Mogami. The Cable Matters 2-Pack follows closely in 3rd place for several reasons. These cables have 3 layers of shielding: Each conductor has its own PVC shield. The manufacturer then wraps both conductors in a foil shield, and then finally in a braided copper shield on top of everything. They use a heavy-duty 16 AWG conductor gauge, the largest on this list. This takes away from flexibility, but will make them more durable. These cables also use a stress free connector design, similar to higher quality builds. And finally, they are cheap, and there are two of them! In professional audio, XLR cables are commonly used for recording and micing. They create a balanced audio signal bridge between the microphone and other hardware such as an audio interface. A balanced and noise-free audio signal connection is paramount when recording. Balanced audio is achieved in the best XLR cables by using shielded twisted-pair cable and three-conductor connectors. Shielding reduces or eliminates electromagnetic interference from external radiation sources over longer spans of cable. Common shielding materials are plain copper, tin plated copper, and aluminum laminate foil. Foil is cheaper and lighter, and great for blocking RF interference, but less rugged and only suitable for stationary cable and specialized applications. Braided copper shielding is more effective as a shield due to higher conductivity, and tin plated copper reduces corrosion. The conductor carries the audio signal, and copper is the best choice of material. Oxygen-free copper is not known to have any significant increase in conductance. Still, some audiophiles insist on having it. Stranded conductors are better than solid, because they are more resistant to flexural stress and more reliable. More strands means more a more durable and flexible cable that will stand to physical abuse in a live performance. Cable lay is the distance required for one strand of the conductor to make one revolution. XLR cables can have 2 or 4 conductors and they are woven in a spiral pattern around eachother. A shorter lay means more revolutions per unit length, and the better the cable will perform. higher capacitance can modify the voltage signal being transmitted through the conductors, therefore distorting the audio being reproduced by monitors, headphones, etc. manufacturers must balance economics, quality, and specific use or application when designing cables with low capacitance in mind. always look for strain relief designs in your connectors – these will add significantly to the reliability and life of your XLR cable. The video above shows an example of what a poorly designed XLR cable looks like. We can see the solders have failed due to high stress placed on the connection.Towards the end of the video, we can see that the braided shielding is also lacking in coverage. Make sure you avoid the XLR cable brand in this video at all costs! These factors along with the prices were taken into consideration while formulating this list of the best XLR cable available in 2019. Let’s take a look. Audio-Technica is a heavy-hitter when it comes to producers of quality pro audio gear and consumer electronics, and their XLR cables are no exception. Audio-Technica was established in Tokyo, Japan, in 1962 and is now a conglomerate of several corporations all working to provide quality audio solutions to it’s customers. Products designed and manufactured by the company have also been nominated for and won several TEC awards, including their ATH series closed back headphones and AT series condenser microphones that are used for broadcast and recording applications worldwide. With a solid track record and trusted global brand name, these XLR cables are one of the best. The stranded copper conductors and PVC inner shields make the Audio-Technica 15′ Premium Microphone Cable (AT8314-15) a great choice for environments with high amounts of electromagnetic interference and radio noise. Dual spiral copper shields aid in reliability and flexibility, ideal for live performances. Cable Matters is a smaller company focusing primarily on – you guessed it – cables! All products and materials from Cable Matters are sourced from reputable manufacturers whom operate out of ISO14001 and ISO 2004 certified factories. All of their products are also UL, RoHS, CE, and FCC certified. While they may not have an established brand name or long track record, their excellent ratings and reviews from hundreds of satisfied customers can vouch for the value they provide. In addition, these cables come in pairs and they are very inexpensive. The Cable Matters 2-Pack XLR Microphone XLR Cable is a great economical choice for someone who’s on a budget. Heavier gauge conductors will reduce flexibility, so these are better suited for stationary/studio use. Mogami is another Japanese company that began experimenting with the causes of audio signal degradation in cables many years ago. Through R&D they eventually created their Neglex cable, which at the time revolutionized the industry. In modern times, Mogami is known throughout the professional audio world specifically for their exceptional XLR cables. Mogami cables are produced in their Nagano, Japan facility under stringent standards and under the supervision of their founder. Marshall Electronics located in California distributes Mogami cables for North America. 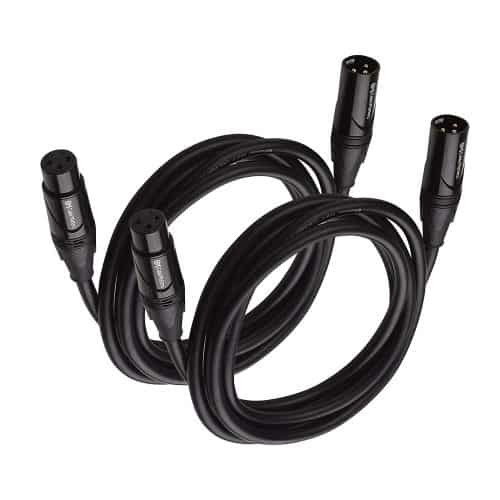 These Mogami quad cables are pricier and should be used where very intense radio interference is a problem, or when XLR cables are will be located in very close proximity to power cables. They can offer up to 95% noise reduction versus twisted pair conductor cables in certain situations. The gold contacts will corrode less than silver over very long periods of time. Visit the Mogami website for more detailed specs. 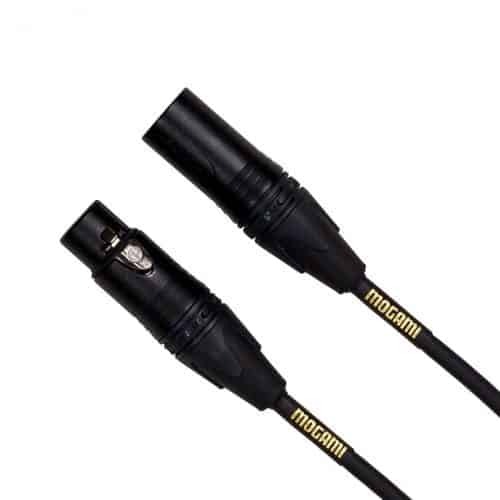 Like we mentioned earlier, Mogami is a very reputable XLR cable brand used globally in professional audio applications. Mogami holds their manufacturing practices to very high standards and they have a clear goal in mind – the most accurate signal transfer possible. For that reason, we featured not one, but two Mogami XLR cables in our list! These Mogami cables are better suited for live stage use as the name implies, while the Mogami Gold Studio cables we covered previously are better suited for recording studios and broadcast. 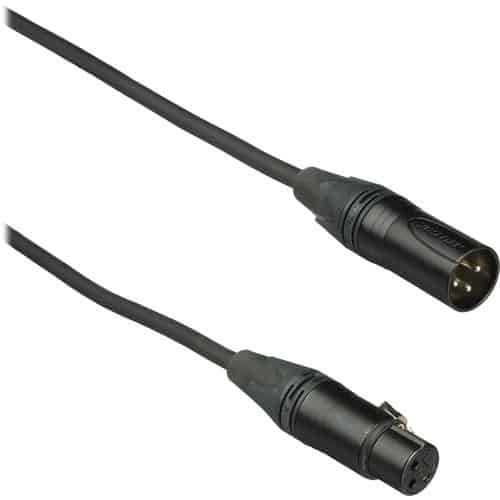 These Mogami quad cables are pricier and should be used where very intense radio interference is a problem, or when XLR cables are will be located in very close proximity to power cables. 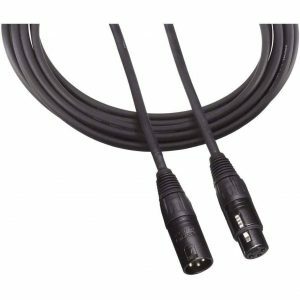 They can offer up to 95% noise reduction versus twisted pair conductor cables in certain situations, and are more ruggely-built to provide a long lasting XLR cable that will hold up against abuse on stage. Gold contacts will corrode less than silver over longer periods of time. Visit the Mogami website for more detailed specs. Kopul is a brand of the Gradus Group, a supplier of photography, video, audio, computer, home and portable entertainment products. The Kopul branch focuses primarily on audio and video cables and connectors for all sorts of applications, including pro audio XLR cables. Kopul creates a wide variety of items, including specialty XLR cables like the one on this list. Their items are designed by the very engineers and technicians that use them in the field. Check out the Kopul website for more details on the company. People use this specialized XLR cable in the electronic news-gathering industry. The Kopul M40003RC is a great choice for news reporters looking for an XLR cable to connect a shotgun mic to their news broadcasting camera. Kopul is a brand of the Gradus Group, a supplier of photography, video, audio, computer, home and portable entertainment products. The Kopul branch focuses primarily on audio and video cables and connectors for all sorts of applications, including pro audio XLR cables. Check out the Kopul website for more details on the company. The Kopul Studio Elite 4000 Series XLR cable is a solid high-end studio and broadcast choice. The high-quality Neutrik connectors and additional build quality raise the price above the more economical choices, but will add to a cleaner signal in the long run, especially when paired with a 3-year warranty. GLS Audio is another smaller family-owned company out of Orange Grove, California. The founder Gary Sunda originally started building guitar amps in the 60’s, and also began doing other audio gear repair work for local clients with the help of his wife. Gary eventually went on to design Randall guitar amps in a partnership with Don Randall himself. Gary’s family eventually saw a need for cheap XLR cables that still maintained pro audio grade performance. GLS Audio was able to achieve this by selling cables directly from his family owned business to the buyer, greatly reducing the price while maintaining quality. For this reason along with excellent ratings from happy customers, these cables make it on our list of best XLR cables. 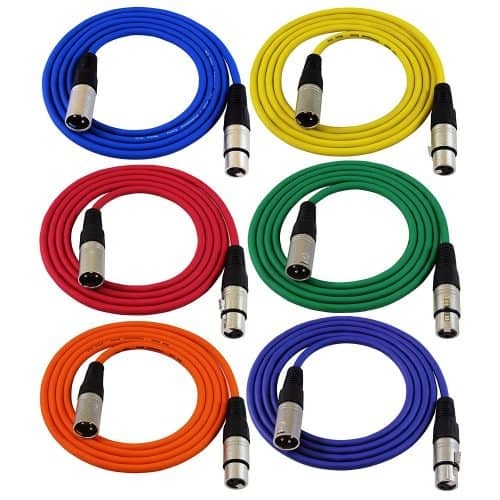 The main advantage of these XLR cables from GLS Audio is the multiple colors they come in. This can help keep things organized and less confusing on the stage and in the studio. They utilize thick 21 AWG copper conductors and have a thick flexible jacket for more durability and less stiffness. GLS designed these connectors with stress relief and reliability in mind. Hosa Technology is another well known supplier of digital and analog audio gear for hobbyists and pros alike. They started in 1984 mainly with electronic adapters and their main offices are in Buena Park, California. Hosa is still known to this day for its quality adapters and XLR cables. Hosa seems to be on the cutting edge of their industry, and they regularly come out with new and innovative ideas and solutions for their customers. Let’s take a look at the features and specs for the #1 pick on our list of best XLR cables. 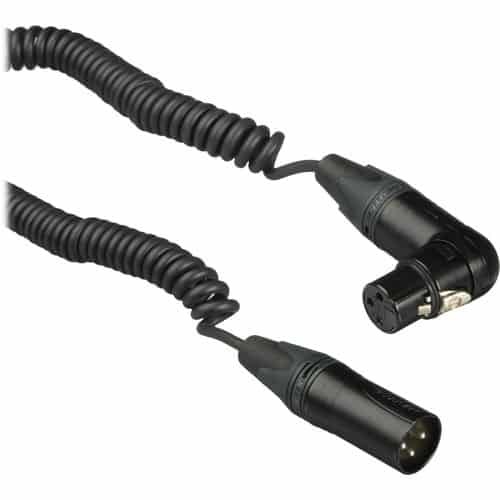 The Hosa HMIC REAN XLR3F to XLR3M Pro XLR Microphone Cable is an excellent choice for low to mid-price XLR cables. REAN is a brand of Nuetrik, making the REAN connectors very reliable. Silver contacts also help to reduce the price while boosting conductance, making these arguably the #1 bang for your buck when it comes to the best XLR cables on the market. Visit the Hosa website for more details and specifications. Like we touched on earlier, Hosa Technology is a popular supplier of electronic adapters out of Buena Park, California. This specialized XLR cable adapter from Hosa splits your mic signal in two. 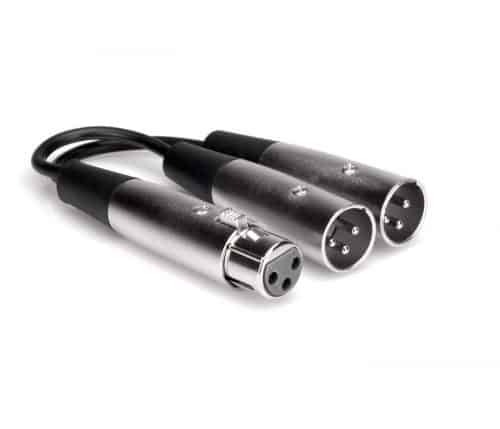 The Hosa YXM-121 XLR3F to Dual XLR3M Y Cable is a specialty XLR cable you can use for splitting a mic signal into two. You can then route each signal to separate mixing console inputs. 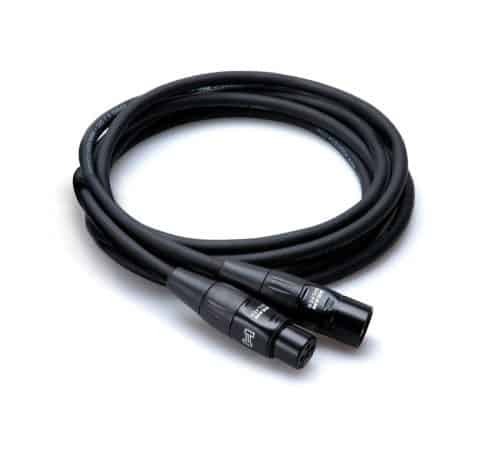 The Hosa YXF-119 Y Cable, XLR3M to Dual XLR3F Cable does the exact opposite. It can take two mic signals and combine them into one. Both have adequate shielding, internal connector stress relief components, and contact material selection to get the job done. LyxPro is the final supplier in our list of the best XLR cables. This company sells a wide variety of audio equipment including microphones, headphones, speakers and PA systems, cables, instruments, stands, and signal adapters. While their brand isn’t as established as others on the list, they do have great ratings and reviews for their star quad cables. Users say this cable is well built and by its very nature it rejects nearly all of any stray RF radiation that may ruin your signal. The price of these cables for the quality is what really makes them stand out from the crowd. For a quad cable with gold contacts and the lengths available, the LyxPro Quad Series is a good deal. The cotton layer between the four conductors and the shield will prevent any static discharge interference. And these cables also come with a 5-year warranty! Ultimately, your decision here should be based off the specific use and application for your XLR cable. For a live performance application, you want to go with dual spiral braid shielding, a smaller diameter conductor (higher AWG gauge), and high-quality, durable connectors. For studio or broadcast, non-spiral braid is best. Oxygen-free copper doesn’t help much at all, and I wouldn’t put too much emphasis on that in your decision-making process. Quad cable is great for special applications with high amounts of interference. Silver contacts are more conductive than gold, but gold is more corrosion-resistant over very long periods of time. Thanks for reading, and I hope this helps you make a great choice for your XLR cable purchase!